The eastern half of the United States has been trapped in a deep freeze for most of February 2015. Hundreds (maybe thousands) of records have been set for daily low temperatures, and wave after wave of ice and snowstorms have hit the region. The coldest days of the year usually occur in January, yet February 2015 has been exceptional in many places. 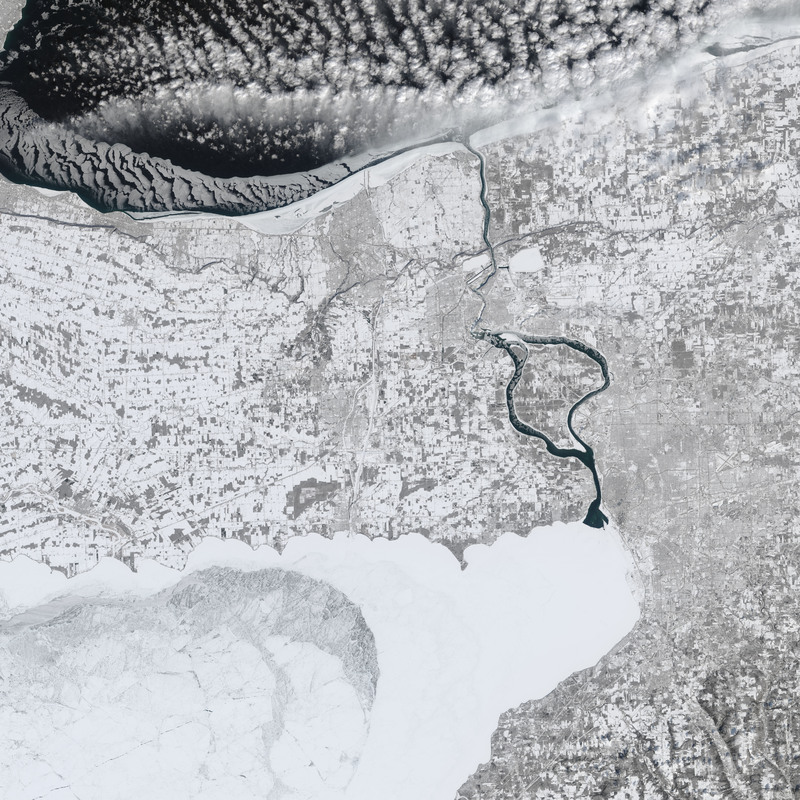 Several satellites captured views of the frozen landscape from above, observing saltwater sea ice in East Coast harbors and freshwater ice in the Great Lakes and other inland waterways. 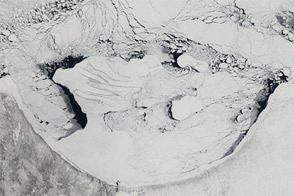 Snow and ice have blanketed land surfaces from the Mississippi River to the Atlantic Ocean, from the Carolinas to Maine. 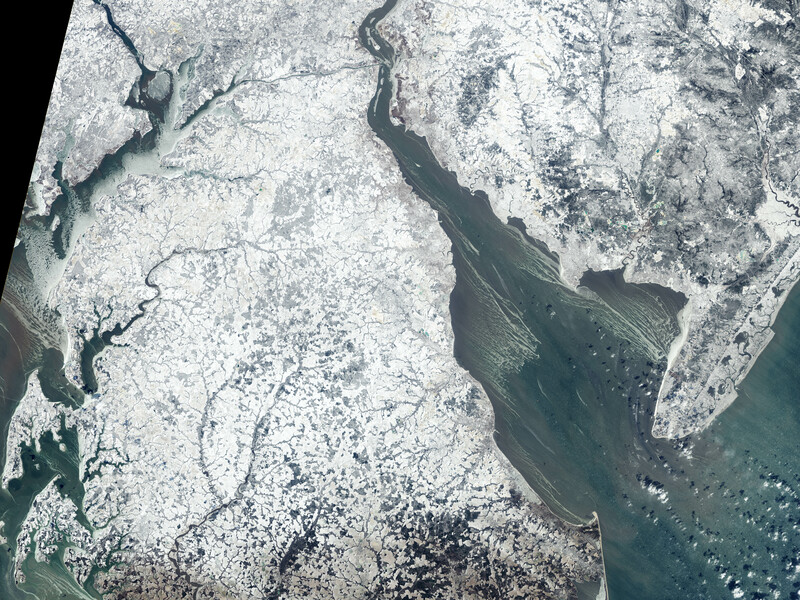 On February 20, 2015, the Operational Land Imager (OLI) on Landsat 8 captured a natural-color view (above) of the U.S.-Canadian border along the Niagara River. Note how a manmade ice boom keeps the mouth of the Niagara River clear near Buffalo, New York. 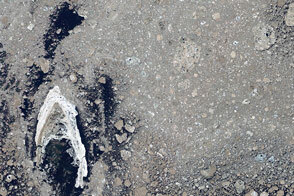 As of February 27, Lake Erie was 95.9 percent covered in ice, while Lake Ontario was at 48.9 percent. Overall, the five Great Lakes combined were 84.1 percent ice covered. 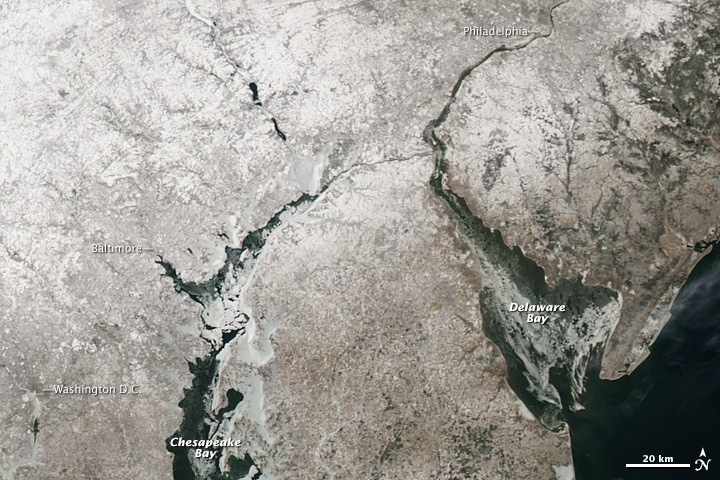 Below you can see a trio of images showing the Mid-Atlantic region. 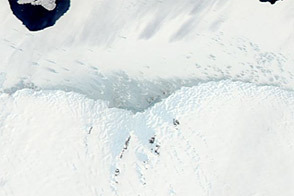 The first image was captured on February 24 by the Moderate Resolution Imaging Spectroradiometer (MODIS) on NASA’s Aqua satellite. 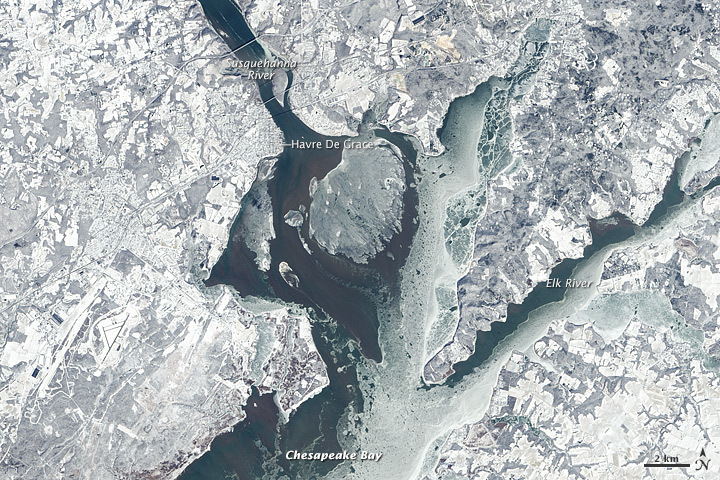 It shows ice in Delaware Bay—between New Jersey, Pennsylvania, and Delaware—and in the northern end of the Chesapeake Bay between Maryland and Delaware. 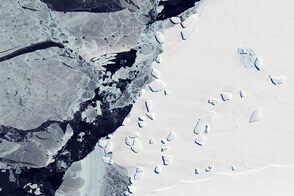 The following two images (from February 15) come from the Landsat 8 OLI and show closer views, including ice streamers. 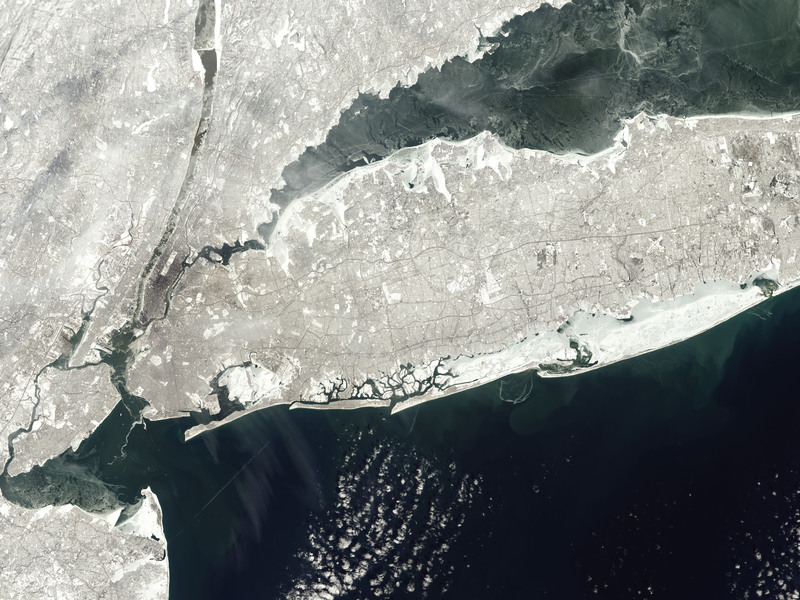 The waters around New York City have been choked with ice as well, slowing ferry and ship traffic in one of the United States’ major sea ports. 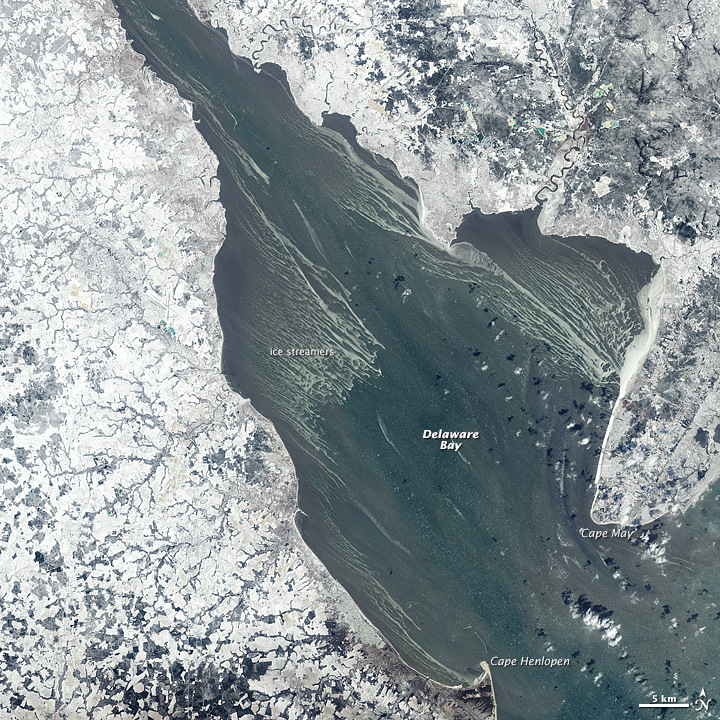 The Landsat 8 image below (February 24) shows ice extending far up the Hudson River, across Long Island Sound, and into New Jersey’s Raritan Bay. This winter has kept the weather statisticians busy. Bangor, Maine, is on course for its coldest month ever recorded, and Syracuse, New York, has had 20 days below zero (Fahrenheit), a new winter record. On February 23-24 alone, at least 67 temperature records fell. Montpelier, Vermont, dropped to -23°F; Glens Falls, New York, dipped to -26°F; and Columbus, Ohio, was at -11°F. Punxsutawney, Pennsylvania, home of the infamous weather-predicting groundhog, touched -20°F. 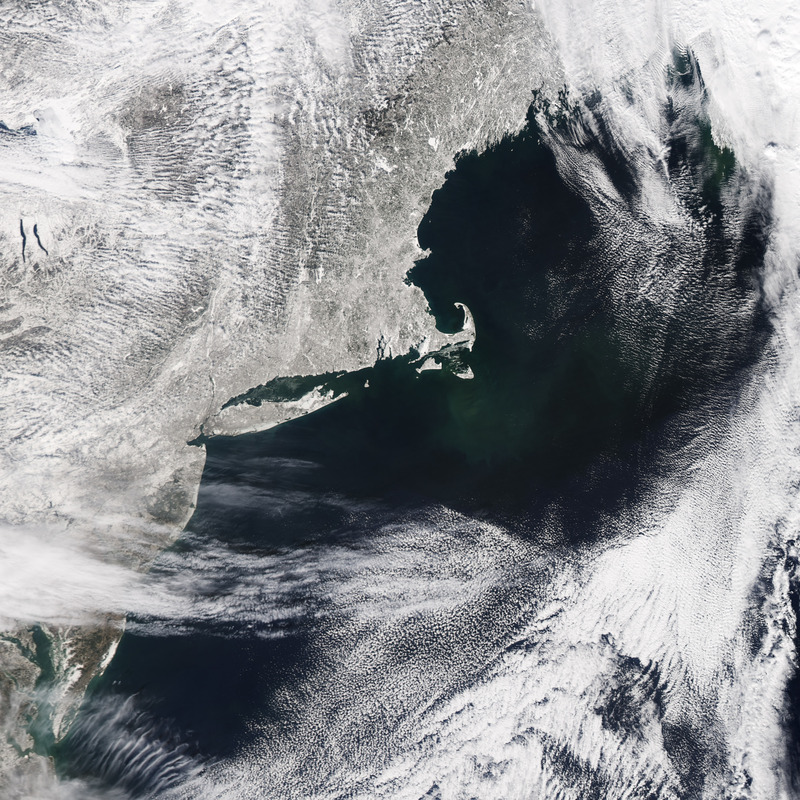 Finally, Aqua MODIS captured this view (below) of Cape Cod and the Islands in southeastern Massachusetts on February 25, 2015. The U.S. Coast Guard warned mariners of severe ice conditions in coastal waterways and noted that its ice-breaking capabilities were limited by the thickness of the ice. Many navigational buoys and other markers were knocked off their locations or submerged by sea ice, and the Coast Guard encouraged ships to sail by daylight and in visibility of at least one mile. By late February, Boston, Massachusetts, had reached 100 inches of snow and was just a few inches short of the all-time record; the yearly normal is 32 inches. Bangor, Maine, has seen 110 inches of snow compared to the norm of 48. 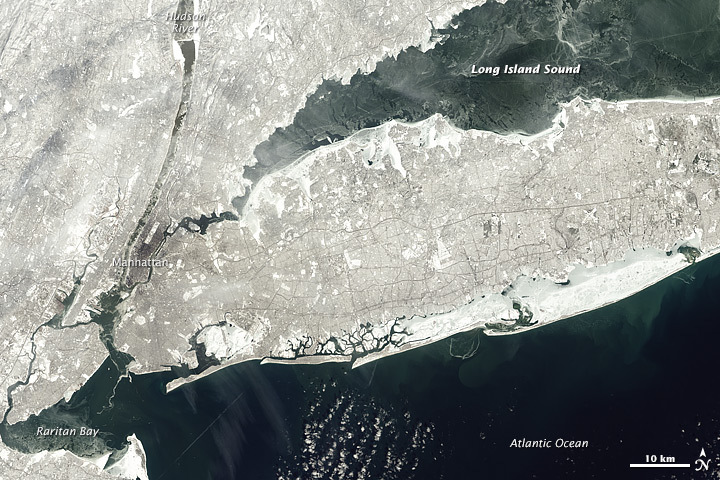 Most of the New York metropolitan area had double its usual snowfall. 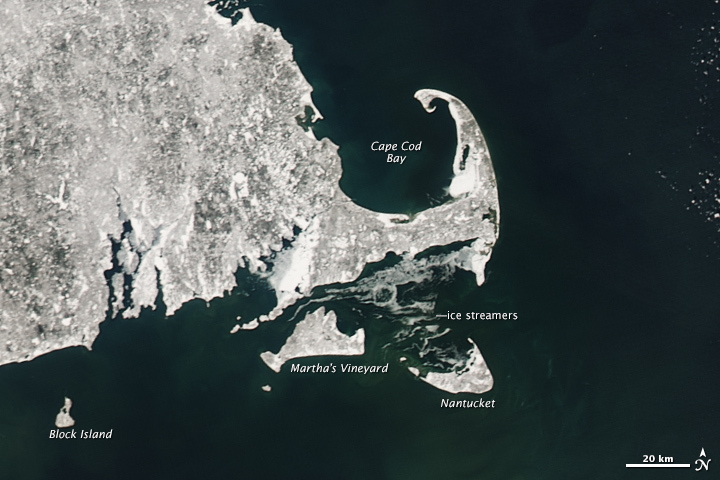 And the ocean around Nantucket was so cold and ice-filled that waves took on the consistency of slush, as shown in these photographs. 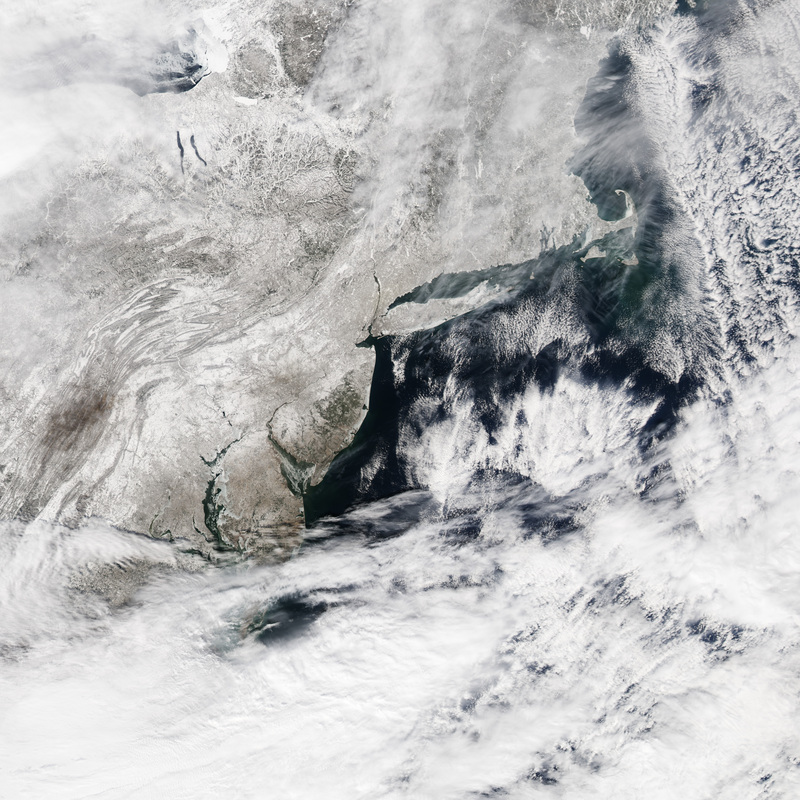 The Boston Globe (2015, February 26) The 2015 Boston Snowpocalypse, From Above. Accessed February 27, 2015. Capital Weather Gang at The Washington Post (2015, February 25) Even as the eastern U.S. freezes, there’s less cold air in winter than ever before. Accessed February 27, 2015. Mashable (2015, February 19) U.S. hot with the most unusually cold air of any region in the world this week. Accessed February 27, 2015. Mashable (2015, February 20) What the extreme eastern U.S. cold snap looks like on a world map. Accessed February 27, 2015. 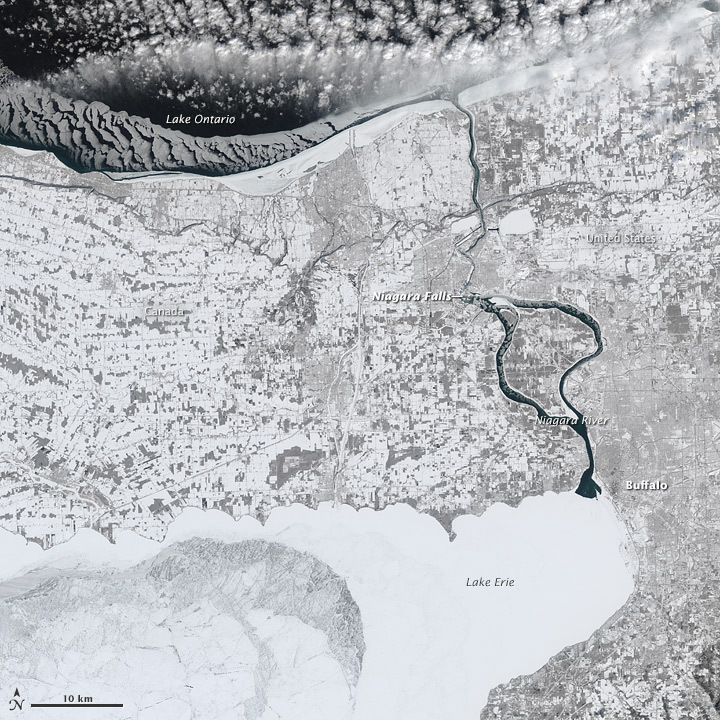 NOAA Great Lakes Environmental Research Laboratory (2015) Great Lakes Ice Cover. Accessed February 27, 2015. The Providence Journal (2015, February 25) Coast Guard warns of severe marine ice. Accessed February 27, 2015. National Weather Service Eastern Region (2015, February 24) Low Temperature Records Set or Tied. Accessed February 27, 2015. National Weather Service Eastern Region (2015, February 20) Low Temperature Records Set or Tied. Accessed February 27, 2015. Stay Wild magazine (2015, February 24) The Slurpee Waves of Nantucket. Accessed February 27, 2015. Weather Underground (2015, February 20) A Nation Divided: Heat and Cold Records Split the U.S. Accessed February 27, 2015. 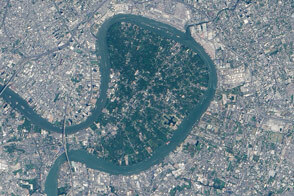 NASA Earth Observatory images by Jesse Allen, using Aqua MODIS data from the Land Atmosphere Near real-time Capability for EOS (LANCE) and Landsat data from the U.S. Geological Survey. Caption by Michael Carlowicz. 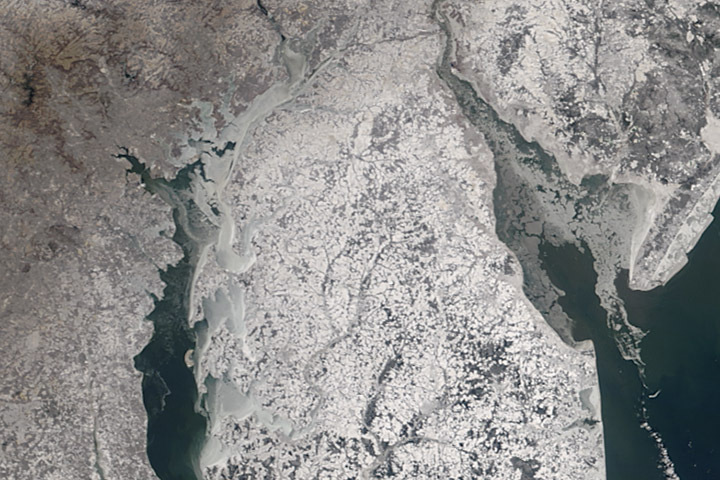 Record-setting cold temperatures have iced up harbors and waterways across the eastern United States.